Preheat oven according to package directions on pizza crust (such as Fabulous Flats). Crumble 4 ounces Gorgonzola cheese; sprinkle over crust. 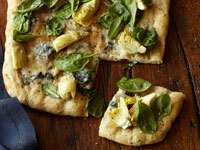 Drain and quarter artichoke hearts; arrange on crust. Drizzle olive oil over crust, cheese, and artichoke hearts; bake until cheese is melted and crust is golden (about 10 minutes). Remove from oven; cover with 3/4 cup spinach. Let sit 5 minutes. Slice into 8 wedges; serve.